On Australia's Phillip Island, these Little Penguins have an adorable habit. Hundreds emerge from the ocean at sunset, shaking off water and waddling home to their burrows. But it was this very cuteness that endangered them — until the locals came up with an ingenious solution. As their name implies, Little Penguins (also known as Fairy Penguins) are the smallest of the penguin species. They're about a foot tall as adults, and their dark feathers have a blue sheen that appears black during the sunset and pre-dawn hours when most people observe them. Little Penguins nest in shallow, cozy burrows beneath mats of vegetation, sometimes wiggling as much as 2 km inland to reach their territory — squawking greetings and territorial warnings to their fellow birds along the way. As I discovered when I visited Phillip Island earlier this month, the entire spectacle is like witnessing a herd of humans coming home from work, only with a lot more feather cleaning, wing pinwheeling, and general OMG-I-want-to-cuddle-now-ness. And that's the problem. Since the early twentieth century, people have been flocking to Phillip Island for both its natural beauty and the so-called Penguin Parade. Vacation homes were built in the areas where penguins dug their burrows. Excited humans would run around picking up Little Penguins as they came in from the sea, sometimes destroying the waterproof seal on their feathers. So many people crowded the beaches to witness the cuteness that the penguin population on Phillip Island was threatened. In the 1970s, their numbers were plummeting. Though the Little Penguin species wasn't going extinct throughout the world, they were going to disappear from Phillip Island — and this endangered the species as a whole. 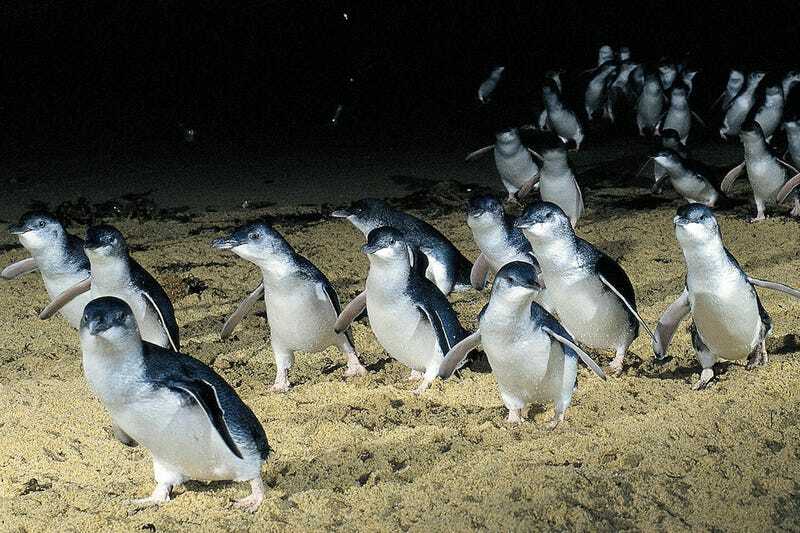 Scientists predicted there would be no more Little Penguins on Phillip Island by the time the twenty-first century rolled around. Until local park rangers, scientists, and the Australian government came up with a penguin-saving strategy that seemed crazy — until it worked. In the mid-1980s, the state of Victoria announced a new kind of park reserve would be created in the Little Penguins' territory. An environment would be created where humans could watch the penguins, but the penguins' territory would be completely protected from harm. Even more innovative was the funding model: This park it would be funded almost entirely by private money that came from tourism. The government, for its part, would buy back all the vacation homes that had been built in penguin territory, demolish them, and give the penguins back their burrows. The penguins also love to shake water off and preen in sheltered, dark places when they emerge from the water. So the park managers created elevated boardwalks that serve a dual purpose: people can watch the birds from there without disturbing the parade, and the birds can go underneath them to get that nice sheltered spot when they need it. As you watch the birds come in from the water, you'll often see them duck underneath your feet on the boardwalk, only to emerge in a more stately, de-mussed fashion. This year, the last of the vacation homes was bought back from a private owner and demolished. So now when you visit Phillip Island, the entire park is full of small mounds that house penguin burrows. And the penguin colony has bounced back from under a thousand individuals in the 70s, to the current number of 30,000. It didn't take much to do it — it was just a matter of giving the penguins their territory back. And thinking sensibly about how to accomodate the human tourists and the penguins at the same time. Every day, hundreds and sometimes thousands of people visit the Phillip Island Nature Park to see the penguins. They get an eyefull of adorableness, and the price of their admission helps maintain the park. Hundreds of scientists have worked in the park over the years, learning more about the penguins as well as nature preservation strategies. They've learned that these penguins often venture out into the ocean for weeks at a time, sleeping out on the water, before returning home. They'd discovered that Little Penguins are so territorial they often burrow in the same place where they were born, creating family legacy burrows. And they know that these penguins often get "remarried" at some point, with female penguins switching burrows to pair up with a new mate every few years. Most of all, they've learned that it's possible to bring a colony of animals back from a near-extinction level event just by changing how we behave and how we inhabit the landscape. Little Penguins were never endangered as a species, but their colonies on Phillip Island were almost destroyed. And now they are back in strong numbers. Think of it as one of humanity's first successful experiments in preserving an environment by observing both animal and human behavior and coming to a compromise. We still get our cute penguins, and the Little Penguins can now thrive in their habitat. You can learn more about Phillip Island Nature Park on their website. And if you are visiting Victoria, I urge you to take a trip out there. It's off the coast of Melbourne.